In 1999 Loyola University Press’ imprint, Wild Onion Books, published a book David Starkey and I edited. 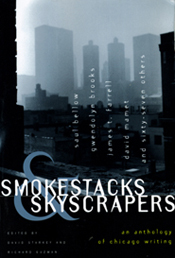 Smokestacks and Skyscrapers was the first major anthology of Chicago writing in nearly 50 years and by far its most comprehensive. It gained much critical praise. Here are some “sound bites,” and at the end of this post you can link to more about Smokestacks and Skyscrapers—including a complete list of writers included and excerpts from a WGN radio show. Go Here to read more and BUY the book. “…fabulously talented performers and editors.” Rick Kogan—of the Chicago Tribune and WGN—said this after David and I were guests on his WGN show The Sunday Papers. Below you can hear three versions of the show: an excerpt, nearly the whole thing, and an excerpt of Starkey and I performing a section from Nelson Algren’s Chicago: City on the Make. Starkey and I performed several pieces from the book in shows all around the Chicago area, a practice I continued for some time with my sons Daniel and Bryan after Starkey left for the more scenic climes of California. When my book Black Writing from Chicago came out in 2006, my sons and I had even more Chicago material to perform. I would “lecture” about Chicago literature, but performance was always the center of our events. Bryan, though, died in 2006, about a month after our first show using material from both Smokestacks and Black Writing. You can read more about Bryan and two of the memorials to him on the Emmanuel House/Bryan House main page. Below are various versions of David and I on Rick Kogan’s show, and Bryan and my wife Linda were in the studio watching it all unfold. • Hear Rick Kogan’s radio interview with David and me. • Go to list of Chicago writers included in Smokestacks and Skyscrapers. • Go Here to BUY the book. This entry was posted in Chicago Writing and tagged Anthology of Chicago Writing, Chicago Writing, David Starkey, Richard R. Guzman, Rick Kogan, Smokestacks & Skyscrapers, WGN radio. Bookmark the permalink.